This Laysan albatross chick has "droopwing," a symptom of lead poisoning. Photo by B. Keitt. Populations of Laysan albatross face severe declines due to widespread lead poisoning of chicks unless comprehensive cleanup measures gain momentum, according to a recent study. 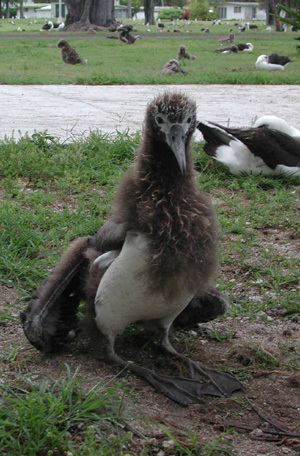 Myra Finkelstein, an environmental toxicologist at the University of California, Santa Cruz, said she hopes that the recent findings will help spur cleanup efforts on Midway Atoll, where lead-based paint from abandoned military buildings contaminates nearby nests. "Lead poisoning could be killing up to 10,000 chicks per year, and it's affecting the long-term survival of Laysan albatross," said Finkelstein, who led a study of the effects of lead poisoning on long-term population stability in the albatross. The researchers reported their findings in a paper published online October 20 by the journal Animal Conservation. Finkelstein estimated that as much as seven percent of new offspring die each year from lead poisoning on Midway's Sand Island. If this trend continues, albatross populations may decline by 16 percent over the next 50 years, she said. The largest threat to Laysan albatross populations, however, isn't lead poisoning but the long-line fishing industry. Large numbers of adult albatross attracted to trails of bait behind fishing boats end up snagged on the hooks and drowned. The number of albatross claimed by fisheries "bycatch" is hard to pin down. But the impacts are severe, and efforts to reform the fishing industry have met with consistent setbacks. According to Finkelstein, the most effective conservation strategy would incorporate both fishing reforms and lead-paint cleanup. In 2003, Finkelstein identified the source of lead poisoning on Sand Island: 95 decaying buildings covered in lead-based paints. Chicks eat the paint chips that blow or fall into their nests. Finkelstein has even observed chicks eating peeling paint directly from the buildings. The most visible symptom of lead poisoning in chicks, called "droopwing," is an inability to lift their wings as a result of the toxic effects of lead on the nervous system. Chicks with droopwing are never able to fly and eventually die from starvation or complications of lead poisoning. Even less severely affected chicks often have symptoms that keep them from surviving to adulthood. About 50 percent of the world's 2.5 million Laysan albatross come to Sand Island annually to breed. Finkelstein surveyed the condition of chicks and the proximity of nests to contaminated buildings to evaluate the effects of lead poisoning on the Laysan albatross population. According to Finkelstein's model, the removal of lead paint from the island today could increase the Laysan albatross population size by about 100,000 birds within 25 years. Without a comprehensive cleanup, the problem is likely to get worse, leading to an increase in the number of chicks dying from lead poisoning, Finkelstein said. Long-lived and slow-to-reproduce species, like albatross, depend more on the survival of reproductive-aged adults than on the survival of newborns. If offspring die young, adults can try again the following year. In such species, protecting adults can have a bigger impact on the overall population size than protecting young. But Finkelstein believes that relying on this approach can leave many conservation opportunities underutilized. "Most, if not all, vulnerable species have a multitude of human-mediated factors threatening their survival, not just one," she said. In the case of the albatross, long-line fishery reforms are crucial. But lead paint removal could buffer the population while policy makers work to reform fishing practices. This cleanup is relatively inexpensive and could begin as soon as additional funds become available, said Finkelstein. "Instead of just saying which threat is worse, you can also ask which one can we fix today," she said. "Which one is easier to fix to buy us time?" The U.S. Fish and Wildlife Service (USFWS) has spent $1.5 million on lead-paint cleanup on the Midway Atoll since 2005, according to John Klavitter, deputy refuge manager and a coauthor of the study. Due to funding limitations, the USFWS is only able to clean or remove 10 buildings per year and has fixed 24 of the 95 buildings to date. It will cost an additional $4.1 million to treat the remaining structures, a sum that does not include sand cleanup, said Klavitter. In recent years, both nature and history enthusiasts have flocked to the Midway Atoll in greater numbers. It is now part of the Papahanaumokuakea Marine National Monument established in 2006. Finkelstein said she is concerned that if Sand Island's buildings continue to degrade, lead paint will become a threat to other animal species and to human visitors. "It's such a beautiful place and it has such a historical significance for us as a nation," she said. "I think we should put forward the resources to make it this really amazing place that our kids and grandkids can visit to see the albatross." In addition to Finkelstein and Klavitter, the coauthors of the study include Dan Doak of the University of Wyoming; Melinda Nakagawa of the Moss Landing Marine Laboratories; and Paul Sievert of the U.S. Geological Survey. Funding was provided by the David H. Smith Postdoctoral Fellowship and the Switzer Environmental Leadership Grant.